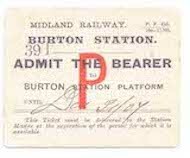 This dataset covers 109 officers, supervisors and clerks employed in the Midland Railway Telegraph Departments in April 1922, with additions and alterations to July 1923, by which time they were part of the London, Midland & Scottish Railway organisation. Most were based at the Company’s headquarters at Derby, with a reasonable number outbased at other locations. DES = Date entered service (i.e. when first employed – which could have been in a different department / at a different location). The exact reasons why there are two dates of entering service for odd employees is not known, but it is possible that the first one related to employment in another department, which would not be taken into account for advancement within the Telegraph Department.